Schooner Ridge Community Amenities included! Ideally located in the heart of the charming town of Duck, Blessed by the Sea is just a short walk from the beach and lots of unique shops, restaurants and activities. This beautifully decorated 4-bedroom, 3.5-bathroom home has it all...alluring decor, endless amenities, plenty of parking, lots of space for your family to spread out & the perfect location! Go for a swim in the large, private swimming pool with an outdoor shower and dressing room, or soak in the hot tub after a long day at the beach. Several spacious decks with ample seating provide the perfect place to relax with a good book or to sip your morning coffee once you’ve made a cup with the home’s Keurig coffeemaker. Looking for an ideal spot to spend a summer evening? Grab a glass of wine and head to the screened porch on the home’s upper level to get away from it all, or have a seat in the hammock swing, kick up your feet and relax. For your ultimate convenience, the owners of Blessed by the Sea have provided beach chairs, a beach cart and a wagon, so you can easily transport everything you need for a day at the beach. This vacation home is conveniently located so that you can do an easy bike (bike rentals are readily available if you don't want to bring your own) through the Schooner Ridge community or making a leisurely trip to downtown Duck to shop for the day or have a bite to eat. Planning to cook a few meals at home during your stay instead of venturing out and about? Blessed by the Sea features a large, fully stocked kitchen as well as a gas and charcoal grill. Whip up your lunch or dinner, and then gather around the picnic table to enjoy good food and quality family time in a beautiful outdoor setting. You’ll never be bored at Blessed by the Sea. The home offers opportunities to play ping pong, corn hole, basketball and volleyball—right in your own backyard. And if you wind up with a rainy day and can’t make it to the beach, you’ll be pleased to find several board games and DVDs to entertain you until the sun comes out. In addition to enjoying close proximity to the sound and the sea, when you stay at Blessed by the Sea you’ll also have access to a variety of resort-like amenities within the Schooner Ridge community. Take a dip in the oceanfront community pool with outdoor showers, or kick back and relax in the oceanfront gazebo while you soak up some salt air and enjoy amazing views of the Atlantic Ocean. You won’t find a better place to watch an unbeatable sunrise over the ocean than this seaside spot! Just two lots to the east of Blessed by the Sea you’ll find an assortment of community amenities, including both an indoor and outdoor pool, a kiddie pool for the little ones in your party, a game room, tennis courts, racquetball courts, a fenced playground and more. Want to get in your daily workout before hitting the sun, surf and sand for the day? The neighborhood recreation center also features a fitness center full of equipment and a weight room. 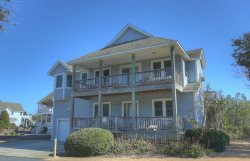 If you’re searching for a family-friendly vacation home just steps from the sea and an assortment of Outer Banks amenities, look no further than Blessed by the Sea! .4 mile / 7 minute walk to Schooner Ridge beach access. A few parking spots are available.